A 41-year-old female pedestrian is dead after a hit-and-run in Scarborough on Thursday afternoon, police say. According to Toronto police Const. Clint Stibbe, the woman was crossing Kingston Road at Warden Avenue at around 3:30 p.m. when she was struck by a westbound vehicle. Stibbe said that the woman was hit with enough force to end up “quite a fair distance” away from where she was struck. 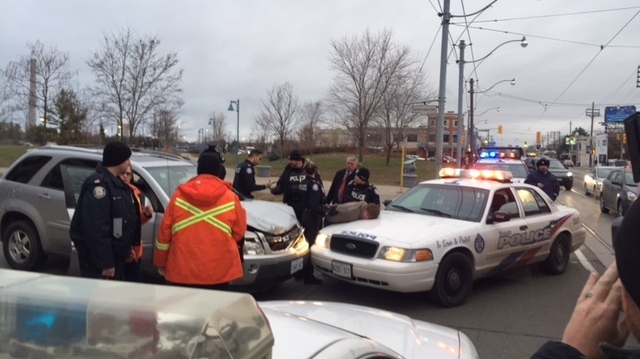 The driver initially fled the scene; however police subsequently made an arrest in connection with the hit-and-run near Queen Street and Northern Dancer Boulevard, which is about five kilometres away from the accident scene. Paramedics confirm that they transported one man to hospital from that scene with minor injuries. Stibbe said that police are looking to speak with anyone who may have witnessed the accident or seen the suspect vehicle after it fled the scene. “We have the majority of the pieces – in particular the evidence at the roadside as well as the driver and the vehicle that we believe were involved – but at the same time there is a period of time in between and we need to speak with anybody who may have seen the vehicle,” he said. The intersection of Kingston Road and Warden Avenue has been closed as police investigate the circumstances surrounding the collision. Stibbe said that police hope to be able to reopen the intersection by 7:30 p.m.